Egg dyeing with kids can be a stressful experience, but this is a great time to embrace the mess and just get down and dirty! 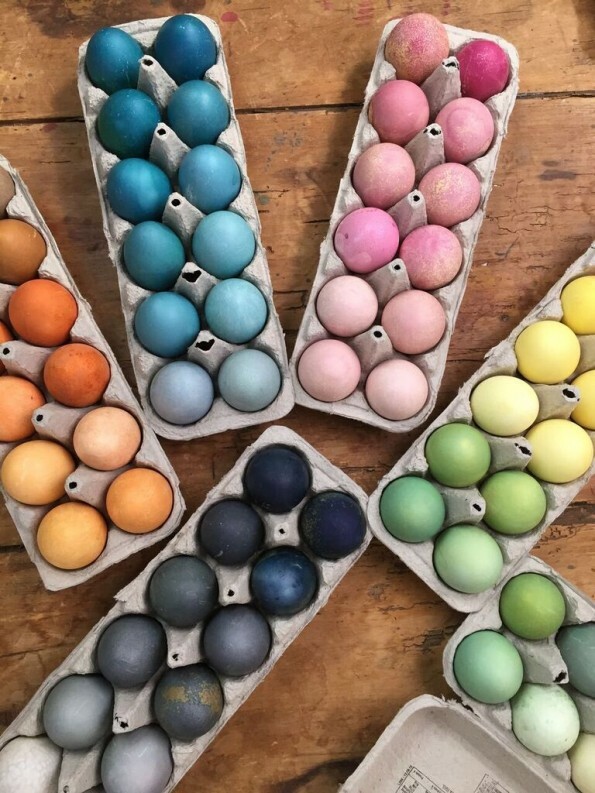 With these ideas from Whole Foods, you can dye your Easter Eggs with natural dyes made from everyday ingredients — combine the dyes with these tips for an eggcellent experience. Dress the kids in play clothes, just in case. Be sure to have snacks on hand to prevent the crabbies, but make sure kids wash their hands after eating to avoid crumbs getting into the dyes. Boil your eggs and make the dyes the day before to save time on decorating day. Make sure your cooked eggs don’t stay out of the fridge longer than 2 hours — they’re not safe to eat after that! Why use natural dyes? For starters, you probably already have many of the ingredients in your pantry. It’s also a great way to combine a science lesson with fun, and there are no worries about what might be in those mysterious dye packets. For more colors, try some of these options. You might need to adjust amounts to get the color you desire, and remember that the color will get deeper the longer you steep! Natural egg dyes often produce their own mottled pattern, but you can also create designs by wrapping kitchen twine around the egg before dipping, or produce leaf patterns by placing a leaf on the egg, then wrapping it in nylon stocking. The results are gorgeous! Do you, Americans, use completely white (bleached) eggs to achieve these colors or use natural orange-to-brown colored eggs? I believe it’s both. The colors may be a little more muted with the orange-brown eggs but I’m sure some of the colors would work.